Gold’s London AM fix this morning was USD 1,646.75, EUR 1,262.26, and GBP 1,052.57 per ounce. Yesterday's AM fix was USD 1,662.00, EUR 1,271.61 and GBP 1,057.93 per ounce. Gold fell more than 2% in New York yesterday and closed at $1,643.80/oz. Gold fell in Asia and its low hit $1,635.66/oz and high of $1,649.9/oz, and is now trading sideways in Europe at $1,647.05/oz. Gold recovered some strength on Thursday after a drop in the prior session attracted bargain hunters, however a strong dollar and diminished expectations of more QE in the US made the yellow metal vulnerable to more selling. Gold has dropped around 8% since late February as institutional funds appeared to have closed out of their bullish gold bets on worries the Fed will not embark on another round of QE to keep interest rates and borrowing costs low. The dollar hit an 11 month high against the yen and a 1 month peak against the euro on Thursday on growing hopes of a US economic recovery and continuing rises in U.S. bond yields. South Africa's gold output fell again in January and was down a very large 11.3% in volume terms in January. Annual gold production is set to be close to 220 tonnes which is a level of gold production not seen since 1922 (see chart below). The falls were seen only in the gold market with production of other minerals holding up with total mineral production down only 2.5% compared with the same month last year. South Africa as recently as two decades ago was the world's largest producer of gold by a huge margin. 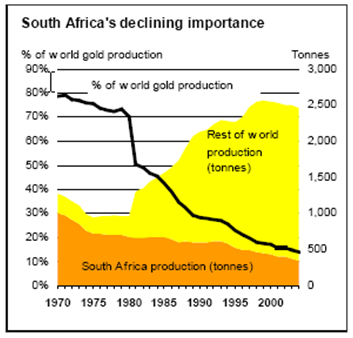 Only 40 years ago South Africa produced more than 1,000 tonnes of gold per annum but will only produce some 220 tonnes in 2012. Production peaked in 1970 and has been falling steadily and sharply since. The nearly 80% fall in South African gold production has led to it being recently overtaken by China, Australia and the U.S. It is now even at risk of being overtaken by Russia. 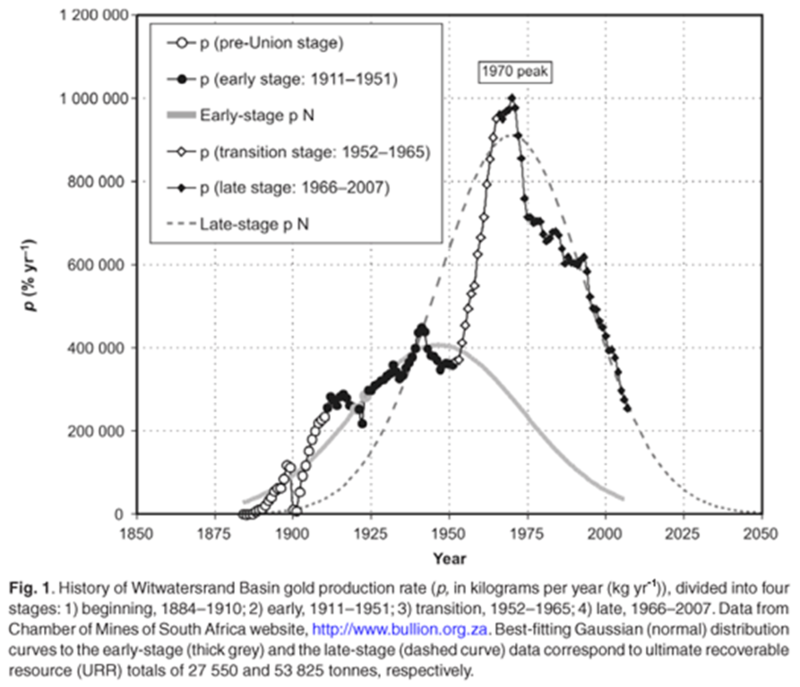 The scale of the collapse is such that it is worth considering the possibility that the Apartheid regime may have exaggerated the size of South African gold production. Indeed, similar questions could be asked of the massive increase in China's gold production in recent years and whether Chinese gold production tonnage figures are exaggerated. The massive 11.3% decline in South Africa was more than even that seen in December when gold output fell by 8.2%. The continuing output decline is due to many of the country's biggest gold mining operations having reached the ends of their lives and having closed down. Old mines that are still operating are mostly getting deeper and deeper with safety concerns a limiting factor, while new operations coming on stream tend to be either small by comparison, low grade, or both. South Africa's continuing gold production decline is not cyclical and is permanent and is another bullish factor for the gold market in the long term. Geological constraints mean that there is little prospect of any serious reversal in the trend. Geological and the lack of any major gold finds anywhere in the world in the last 20 years also suggest that the supply side of the gold equation remains bullish. The decline in South African production has been a major contributor to at best flat global gold production over the past few years. Indeed, some data suggests that global gold production may have peaked in the early 2000s. In the light of the continuing strong fundamentals, this is another healthy correction in the gold market as investment demand is set to remain strong for the foreseeable future while supply remains tight. Also, central banks are increasingly reluctant to sell their gold reserves and indeed some increasingly wealthy and powerful central banks are adding to their reserves or attempting to gain control of the reserves of smaller debtor nations. Silver is trading at $32.30/oz, €24.75/oz and £20.61/oz. Platinum is trading at $1,673.00/oz, palladium at $689./oz and rhodium at $1,450/oz. Is Another Record ECB Margin Call Impairing Gold Again?